I’m happy to announce that I will be back in Burlington for a few days this coming week. 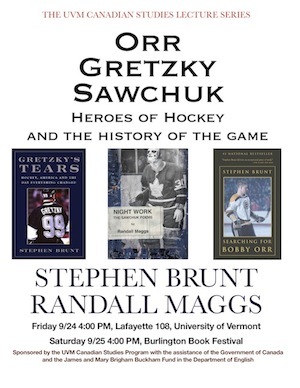 I’m one of the people behind a half-day symposium at UVM that is examining the role of women’s hockey in North America. This event is timed to coincide with the IIHF Women’s World Hockey Championships being held in Burlington from April 7-14th. Our goal is to bring together the worlds of hockey and academia for a conversation about how the game of hockey is changing thanks to the rapid growth of women’s hockey across North America. If you get a chance, please come and join us for this event! A half-day symposium bringing together hockey scholars, writers, players, and fans in celebration of the 2012 IIHF Women’s World Championships. “The Face of the Game: Women’s Hockey in North America” is a half-day symposium examining how women’s hockey is literally and figuratively changing the face of the game in North America. “The Face of the Game” will use a roundtable format, comprised of both academics and some of Canada’s finest hockey writers, to foster an engaging conversation about the role women’s hockey (and sport in general) plays in North American culture, particularly in how we understand and construct gender within sport. The first roundtable, comprised of both academics and some of Canada’s finest hockey writers, will examine the role of women’s hockey in literature and popular culture. The second panel will bring speakers from a variety of backgrounds to examine the past, present, and future of women’s hockey. • Tim Bothwell played 500 games in the NHL, was an Assistant Coach for the Canadian Olympic Women’s Hockey Team in 2006, and the Head Coach of the UVM Women’s Hockey Team from 2006-12. • Elizabeth Etue is the publisher of WINIH.com, co-author On the Edge, Women Making Hockey History and the author of Hayley Wickenheiser: Born to Play. She was the writer and associate producer of the CBC documentary Chasing the Dream and a columnist for The Hockey News from 2005-2008. • Dr. Jeff Gerson, author of a recent study on women coaches in NCAA and Canadian University hockey. Associate Professor of Political Science, University of Massachusetts Lowell. • Richard Harrison, author of Hero of the Play, a best-selling collection of poems about hockey, and co-editor of Now Is the Season, a collection of essays on hockey. Associate Professor of English, Mount Royal University, Calgary. • Cara Hedley, author of 20 Miles, a widely read and studied novel on women’s hockey. PhD student, University of Calgary. • Meg Hewings, General Manager of the Stars de Montréal Women’s Hockey Team, journalist, and graduate student at McGill University. • Dr. Andy Holman, editor of Canada’s Game: Hockey and Identity. Professor of History, Bridgewater State University. • Dr. Paul Martin. Expert on hockey in Canadian literature. MacEwan University, Edmonton.